Confession time: I’ve never actually played Fez before this latest release. Despite having an Xbox 360 and PC, and despite being intrigued by the long-in-development indie darling and its dimension-shifting premise, it was one of those titles that I simply never got around to for one reason or another. But now that the puzzle-platformer hybrid, which originally saw release in 2012, has finally made its way to all of Sony’s currently supported gaming platforms (those being the PlayStation 3, PlayStation 4, and PS Vita), it seemed as good a time as ever to try it out. My final thoughts walking away from the game after finally playing it firsthand are, unfortunately, a little more mixed than I was hoping for. There is undeniably a very clever gameplay concept at Fez‘s core that I think is executed quite brilliantly, and its overall presentation and atmosphere are very appealing. Despite all that though, it accidentally accomplishes something that you’d expect more out of a free-form sandbox title, in that it’s easy to get lost and difficult to figure out what you should be doing. The simple story revolves around Gomez, a cute marshmallow-like being living peacefully with other similar creatures in a two-dimensional, side-scrolling world. When an elder bestows upon him a magical fez, disaster simultaneously strikes, as a mythical rotating cube shatters into numerous pieces. After a clever moment where the game itself appears to glitch and reset to the title screen, Gomez sets out to find the shattered cube pieces, and also finds that he now has the revelatory ability to revolve his world horizontally in 4 90-degree increments. This is the main hook of Fez. While movement of Gomez is always restricted to two dimensions, revolving each environment (done via the left and right trigger buttons) can change the way you approach each section of any given level dramatically. For example, platforms that were previously too far to jump to will now be much closer and vines that you can climb will change their position to a different side of each building. If this sounds like it could be confusing, it actually isn’t most of the time, as the levels are laid out in a clear enough way to give you a good idea of each element’s individual space and placement. While Gomez can be killed by falling into bottomless pits or from too high a jump, your lives are unlimited, and you’ll respawn exactly at your previous location most of the time. The main goal of the game, in classic platformer collect-a-thon fashion, is to find both individual cube bits (of which eight will form a finished cube), rare full cubes, and even rarer dark anti-cubes, along with some uniquely hidden and challenging-to-find secrets in the form of treasure maps, chests, keys, and even real life elements such as QR codes. The game does a good job of providing variety in how you’ll find everything despite sticking to the same relatively simple control scheme and gameplay systems for its majority. 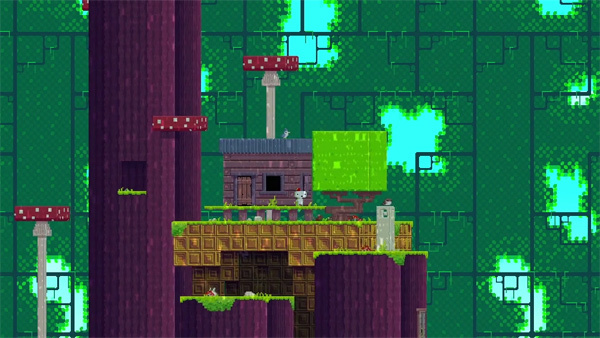 In terms of presentation, if Fez can be summed up in one word, my pick would be charming. The retro 8-bit cubist art style displays a lot of effort put into detail and visual appeal despite its initial simplistic appearance, and while music tracks and ambient sound effects don’t play during every part of the game, what’s there is appealing and often atmospheric. So with all the positive things I have to say about the game, what would the negative aspects be? My problems with the game all stem from one particular aspect, and unfortunately, it’s a major one. Navigation and backtracking in Fez is just plain confusing and unintuitive. Each level has so many individual doors and exits that it’s very easy to get lost. While you can unlock warp gates that instantly transport you to one of several specific locations, there aren’t very many of them, and it can take quite a while to find others besides the initial one. This might have been less of a problem if the map system wasn’t as cumbersome and frustrating as it ended up being. It’s hard to explain in words how it looks, but you essentially get a 3D series of icons for each major level, with lines leading out from them to smaller icons to indicate which sub-levels you’ve discovered and what items are left in each one. It’s certainly possible to decode where you should head to using this system, but it’s still more trouble than it should be, and left me pining for a quick travel system to take you to any previously discovered level at any point. 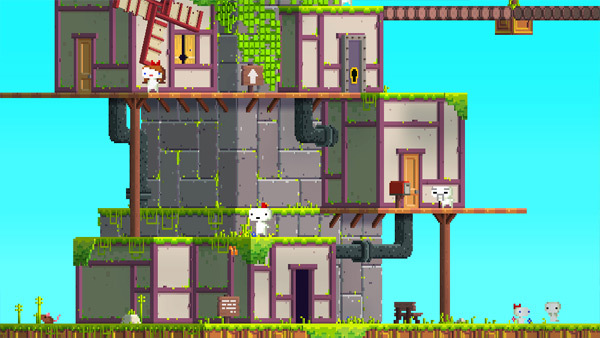 Finally, it’s worth noting that this version of Fez supports both the Cross-Buy and Cross-Save systems, meaning that regardless of which version you initially purchase between the PS3, PS4 and Vita, you’ll be able to download the other versions at no extra cost and also sync a save file between all three consoles via cloud storage. I spent most of my time with the PS4 version, and after an additional session with the Vita version, I will say that I prefer playing the game on a home console. This isn’t so much due to any loss in visual quality (the pixel art style transfers to the Vita flawlessly), but because the Dual Shock 4’s trigger buttons feel much more comfortable than those on the Vita, and some extra functions triggered by touching either of the Vita’s screens happened unintentionally for me a few times. Considering what high marks previous versions of Fez have received, I’m guessing that maybe I’m just not the perfect audience for it. Platformers are one of my favorite types of game, and I can’t deny the cleverness and solid execution of this title’s primary mechanic, nor its charming look and style. I just think that actually getting around the game’s world is a real chore a lot of the time, which put a damper on the experience as a whole for me. 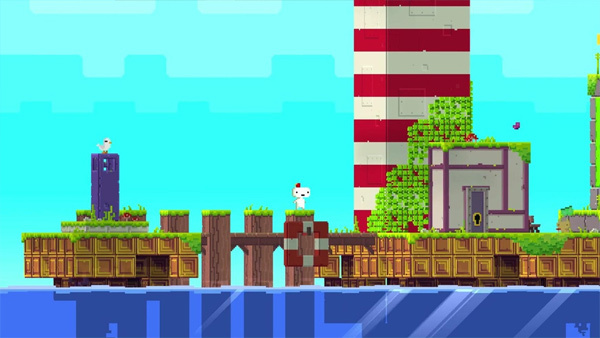 It’s a shame that real world troubles caused the cancellation of Fez 2 shortly after its initial announcement, because if these issues had been addressed in a follow-up game, we could have had a much more solid experience on our hands. As it is, I still recommend the game, especially because of how many other people absolutely love it, but I can’t call it a classic. This review is based on the PlayStation 4 version, which was provided to us.